The University of Illinois Springfield’s Child Protection Training Academy used its mock simulation house to help train first responders from around the country in methods to investigate and document child abuse during a training held September 19-21, 2017, on campus. The class was part of a national course by the Gundersen National Child Protection Training Center, located at Winona State University in Minnesota. More than 20 participants took part in the training that provided detailed instruction in the investigation of a crime scene and how seemingly unimportant details can become critical at trial. The training included instruction on how to interrogate a child abuse suspect, how to photograph a crime scene and how to conduct witness interviews. First responders who were invited to participate included prosecutors, social workers, case managers, forensic interviewers, law enforcement officers, investigators and child protection attorneys. UIS created the Child Protection Training Academy in 2015, in partnership with the Illinois Department of Children and Family Services (DCFS). The Child Protection Training Academy has already trained more than 250 DCFS investigators. The mock house and a separate mock courtroom are also used to train UIS students who are part of the Child Advocacy Studies (CAST) certification program. For more information contact Betsy Goulet, UIS clinical assistant professor and CAST coordinator, at 217/206-8523 or bgoul2@uis.edu. Fall 2017 census numbers show the number of undergraduate students taking classes at the University of Illinois Springfield is similar to a year ago, while the number of online majors is growing. 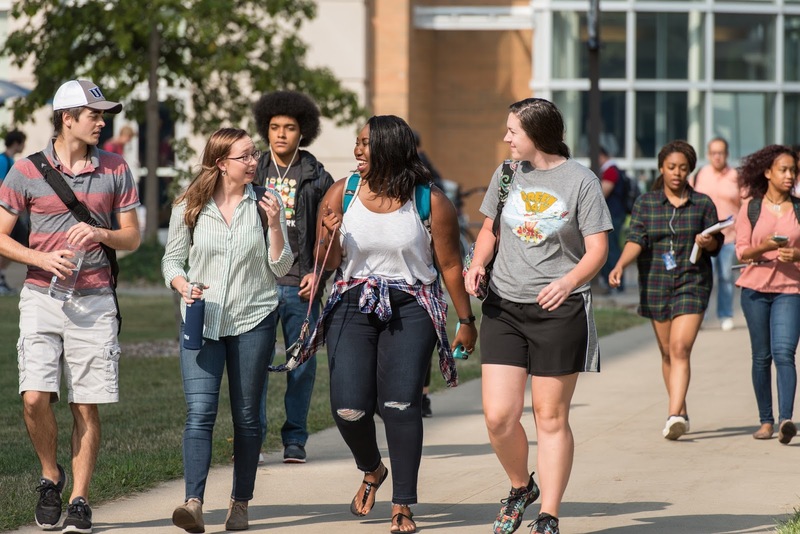 The number of undergraduate students at UIS stands at 2,932 compared to 2,959 in fall 2016. The number of students taking classes completely online continues to increase, with 1,681 students (34% of total) enrolled in online degree or certificate programs. That is an increase of 16 students from last year. This semester, UIS online students reside in 48 states, 70 counties in Illinois and 10 foreign countries. “Despite challenges like the uncertainty of the state budget, I’m pleased that our continued focus on three strategic priorities – growth, talent and facilities – is helping to sustain forward momentum at the Springfield campus,” said UIS Chancellor Susan J. Koch. After the first 10 days of classes, a total of 4,956 students are enrolled at UIS, down from 5,428 students in fall 2016. The number of graduate students decreased from 2,469 in 2016 to 2,024 in 2017. UIS has 420 fewer international students at the graduate level this year compared to last. There are a total of 582 African American students enrolled this semester comprising 11.7% of the student body. Students who self-identify as Hispanic comprise 6.7% (330) of this year’s student body, Asian students comprise 3.6% (180). UIS saw an increase in Illinois residents (72.2%, up from 67% last year) for a total of 3,579 students. International students encompass 13.1% of the students enrolled and 14.7% are non-Illinois residents. “The average ACT score of entering freshmen and their first-year retention rate, both important markers of quality, have continued to increase,” said Koch. UIS is one of three universities in the world-class University of Illinois System and provides students with a high-quality liberal arts education, exceptional public affairs opportunities and outstanding professional preparation programs. UIS has four core strengths: (1) a teaching-focused academic experience; (2) an abundance of opportunities to collaborate; (3) a right-sized supportive community and (4) a tradition of educating public servants and leaders. University of Illinois Springfield students volunteered at nine Springfield locations during the annual Welcome Week Service-A-Thon on Friday, September 1, 2017. The event encourages students to place community first by starting the school year off in service to others. “It’s just a great way for students to connect with their community around Springfield and meet other students on campus,” said RJ Swartz, the AmeriCorps VISTA for the UIS Volunteer and Civic Engagement Center. This year, the students volunteered with the Computer Banc, Contact Ministries, Girl Scouts of Central Illinois, Habitat for Humanity ReStore, Hospital Sisters Mission Outreach, M.E.R.C.Y Communities Inc., the Ronald McDonald House, St. John’s Breadline and the UIS Community Garden. UIS sophomore psychology major Alexus Venegas-Rodriguez of Hoffman Estates says she volunteered before coming to UIS. Now, she wants to give back to new home. “I just really love giving back and helping people out, so they don’t have to work as hard. It just feels good to be helping and making a difference,” said Venegas-Rodriguez. Other students, such as freshman political science major Jennifer Viramontes of Carpentersville, also have a history of volunteer work. She helped to clean up the shores of Lake Springfield at the Girl Scouts of Central Illinois’ Camp Widjiwagan. “We started wiping down mattresses with Clorox wipes and then we’re just clearing off the shore, getting all of the big sticks out of there, any rocks we’re throwing up higher on the shore,” she said. Freshman Annabella Paradies of Genoa volunteered sorting medical supplies at Hospital Sisters Mission Outreach. The unused supplies will be boxed up and shipped to hospitals around the world. Swartz hopes students who took part in the Service-A-Thon will continue to volunteer in the community throughout the school year. “Service is going to be a big part of your time here at UIS, so it’s a good way to start off the year for sure,” he said.